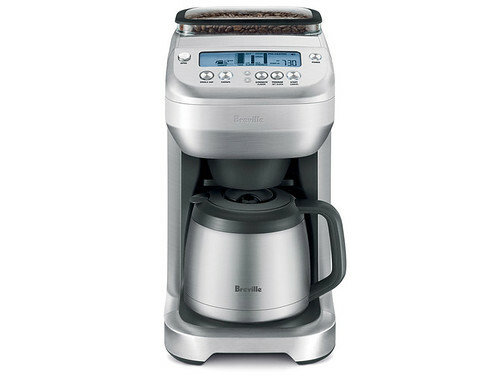 The Breville® YouBrew® — The first coffee maker that tailors the brew for a cup, a travel mug or a carafe. With up to 7 strength setting and up to 5 flavor profiles. It’s your brew, your way, every time. A. Bean Hopper Lid. B. 0.5 lb. Bean Hopper. C. Bean Hopper Locking System - seals the base of the bean hopper for easy removal,storage and transfer. D. Cleaning Brush. 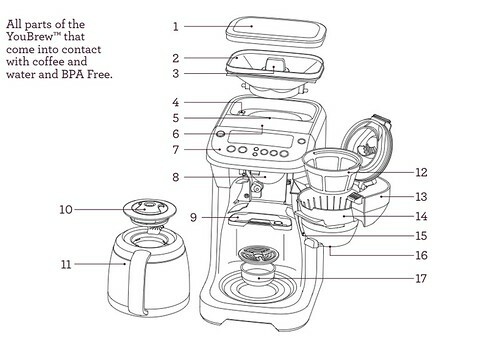 E. Integrated Burr Grinder. F. 12-Cup (60 oz.) Water Tank. G. Contoured Control Panel - for each viewing. H. Coffee Grinds Chute. I. Removable Grinds Catcher. J. Carafe Lid. K. 12-Cup Double-Wall Stainless Steel Thermal Carafe. L. Removable Gold Tone Filter. M. Soft Opening, Swing-Out Door - with safety interlock system prevents operation if the coffee basket is not correctly assembled or the door is not properly closed. N. Removable Coffee Basket. O. Steam Baffle - assists with water overflow if the coffee basket becomes blocked. P. Brew Pause Drip Stop - temporarily ceases the flow of coffee when the carafe is removed. Q. Drip Tray. 1. Open Button. 2. SINGLE CUP button. 3. CARAFE button. 4. 'Up' Arrow button - Use in conjunction with the STRENGTH/FLAVOR button to increase brew strength and flavor. Use in conjunction with the PROGRAM button to program the clock and Auto-Start. 5. 'Down' Arrow button - Use in conjunction with the STRENGTH/FLAVOR button to decrease the volume of the 'Ready' signal. Use in conjunction with the STRENGTH/FLAVOR button to decrease the brew strength and flavor. Use in conjunction with the PROGRAM button to program the clock and Auto-Start. 6. STRENGTH/FLAVOR button - Press to adjust the brew strength. 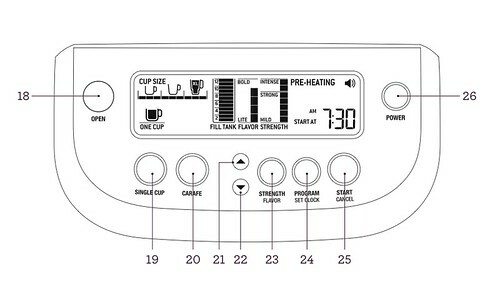 7 settings plus 'PRE-GROUND' coffee setting vary the amount of freshly ground coffee for mild, strong, or intense brew. Press to adjust the flavor. 5 settings vary the steeping time of the coffee and water to produce a light flavored cup or a bolder, more full-flavored coffee. Only Available In 'Single Cup' Mode. 7. PROGRAM/SET CLOCK button. 8. START/CANCEL button. 9. POWER button.